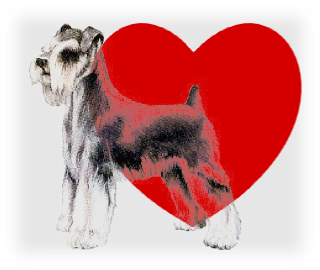 As I walk our Airedale Terrier, Bailey, I especially enjoyed watching my neighbor walk her Miniature Schnauzer. I've missed seeing them lately. Although her dog was 14 years old and blind, he still had the Schnauzer independence. In the winter, the pair is immediately recognizable as they both wear bright red coats. The last time I saw them was in late December. He was determined to go one way and she determined to go the other. I called out, "It's nice to see that dogs besides Bailey are strong willed!" She laughed. "He certainly is that," she replied. Yesterday I learned why I hadn't seen the pair this month. Diabetes was the cause of her old companion's blindness. His vision gone, the condition had degenerated into painful abscesses around his eyes. Her vet told her that it meant a continued and worsening pain for her dog. So, my neighbor did the right thing. She let the vet end his life. Our pets can't speak for themselves so sometimes we have to make very difficult decisions on their behalf. I hope when Bailey becomes old and infirm or ill due to severe injury or disease, I have the courage to do the right thing for him. Today I learned that doctors in Texas had finally let Marlise Munoz go. I read last week that the fetus she carried was not viable; it probably would not have survived outside her womb and if it did, it was likely to be horribly deformed both mentally and physically. I hope if I should become ill due to injury or disease and unable to speak for myself, my family will have the courage to do the right thing for me and my doctors will have the courage to let them. I was surprised to learn that some folks planned to demonstrate against taking Mrs. Munoz off life support. Would these people sentence her unborn child and her family to a lifetime of pain? Would they be willing to pay for her medical support and the probable gargantuan medical bills of her child? Love is kind. Love does 'the right thing'. I wonder, where is their love?